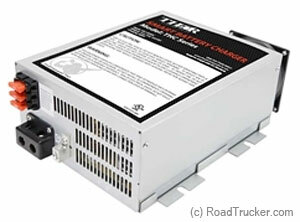 This 18 Amp battery charger features 3 steps optimal automatic charging system (Boots, Normal & Storage). It automatically changes modes to accommodate changes in conditions. Boost - A fast charge to bring a good, drained battery back up to full voltage rapidly . Normal - A standard charge to bring the battery up to a full charge at a safe rate to prolong the life of the battery and provide power to run 12V lighting and appliances in the vehicle/device . Storage - A trickle charge to keep the battery fresh during times of load inactivity.